A Republican congressman called on Federal Reserve chief Janet Yellen to explain how one of the allegedly non-partisan central bank’s governor’s coziness to Hillary Clinton is not a conflict of interest. Rep. Scott Garrett, New Jersey Republican, questioned Yellen on donations that Fed governor Lael Brainard has made to the Clinton campaign and on reports that Brainard is being considered for a senior position in a possible Clinton administration. Yellen said in earlier testimony on Sept. 27 she had “absolutely no awareness” of Brainard’s reported contact with the Clinton campaign about a job. 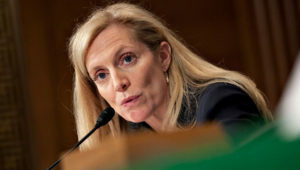 Brainard donated the maximum individual amount of $2,700 to Clinton’s campaign. Yellen said that the Hatch Act does not prohibit political contributions by Fed governors. GOP candidate Donald Trump, in the first presidential debate, said that the Fed has been keeping short-term interest rates low to help the Obama administration and was sustaining a “big, fat, ugly bubble” in the stock market.